18 October 2011: Yesterday on radio 2GB, constitutional barrister Bryan Pape indicated that as the carbon tax will affect State-owned property – the electricity generators – there are grounds for the State governments to challenge the Commonwealth’s legislation … under section 114 of the Constitution. Please add your voice by informing Premier O’Farrell that it is Your Will that the NSW government challenge the Clean Energy Future legislation. My communication to you concerns the [insert State name] State Government budget, and possible impacts on the budget arising from the Commonwealth’s Clean Energy Future legislation. Constitutional barrister Bryan Pape is on public record indicating that the [insert State name] State government has grounds to challenge the Commonwealth government’s Clean Energy Future legislation, under section 114 of the Australian Constitution. IT IS MY WILL that you take immediate action to cause the [insert State name] State government to challenge the constitutionality of the Commonwealth’s Clean Energy Future 2011 (ie, carbon tax) bills in the High Court. 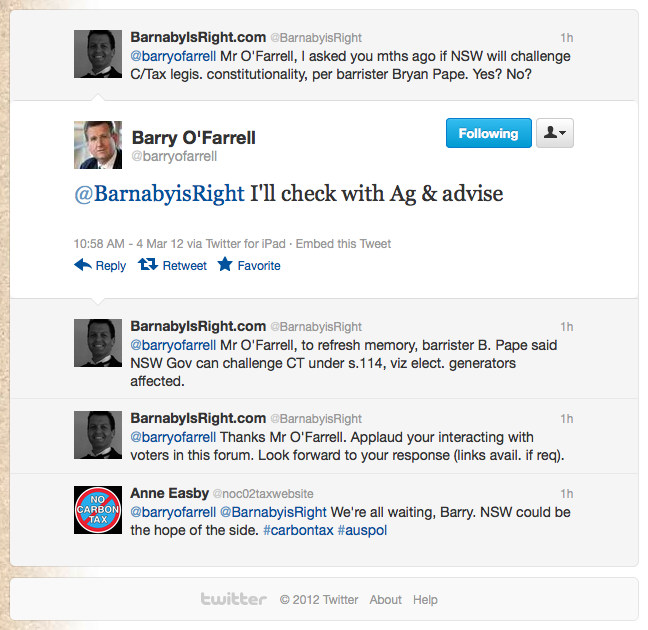 Premier O’Farrell’s contact details can be found here. If you are not in NSW, and your State government owns electricity generation and/or distribution assets, then your State government too should have grounds to challenge the Clean Energy Future legislation. Thank you for making Your Will known to your elected representatives. People power. Make it happen. I really hope Boffa takes the commonwealth to court over the carbon tax and I also hope Barnett from WA takes the commonwealth to court over the mining tax. By their own definition the ALP is guilty of political terrorism. has been able to achieve consensus on this contentious issue. The old adage that ‘one man’s freedom fighter is another man’s terrorist’ goes to the root of the ongoing debate. Individual states, therefore, have been compelled to develop their own definitions for the purposes of enacting legislation to counter the threat.